flour mills, so I have expanded the scope of this Gallery to include those. If anyone knows the names of the unknown elevators, please comment. There is a lot of history behind this old malt house. Buffalo Malting Company on Elk Street in the old 1st Ward of Buffalo. As with any history there are some inaccuracies in this text. I was laboring on the ductwork and mechanicals in this building in 1979. The facility was working at that time. I had no idea there was this much interest in Buffalo Malting. 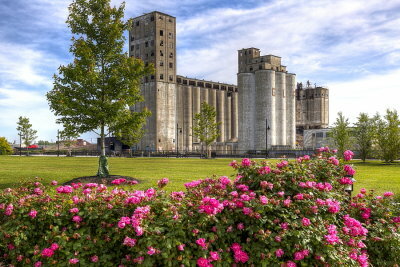 customers were these old grain elevators and flour mills around Buffalo. Many, like this one, have long since closed. you desire is placed there. For John Bisci Jr., There was a explosion and fire in Jan 1972 at the Pillsbury Company Mill, the largest flour mill at the time. One man was killed, John Regdos. You can read the story in the New York Times archive. Mr Regdos was cousin to my mother. My Great Grandfather (George Schaaf Construction) won the bid of $80,000 as Contractor for a Buffalo Malt House in 1915. Any idea if any photos you have are of that building. I assume by now it is gone. These are beautiful pictures. My husband and I stared a malthouse in Hadley, Massachusetts in 2010. He is from Buffalo and remembers the malthouses that are now gone. Western NY was once the largest producer of malting barley in the US. although not photos for the chamber of commerce; interesting forms, perspectives and good documentation. very nice. don, what is the grain mill with the abandoned boat next to it? I can't seem to find a name for it. Can you help me out here? Most of the elevators along the river in the old first ward are ethonal plants (or something like that), there was an explosion there in the early 80's. As for the rest, my father told me that back in the twenties and a little bit later Buffalo depended on all of, in fact the entire eastern seaboard depended on us...that is until they started using the plane more. Very interesting and well photographed. Do you have any idea what the demolition costs were? Enjoyed your gallery, especially since my late father worked at General Mills most of his adult life. You've done a great job photographing these structures; not an easy task. Plus they are a difficult subject to make look good, but you've done it. Monumental Giants! This is a great study. A nice album of historical interest,, Don. Wonderful, fascinating historical gallery, with some great individual shots. Buffalo Malting closed around 1982. I worked for the other malting co. at 100 childs st. That malt house was owned by Genesee Brewing co. when it shut down in 1993. Any questions you may have E-mail me at BOOMERIAM@YAHOO.COM. Great shots. Is this operational. Who owns this facility?